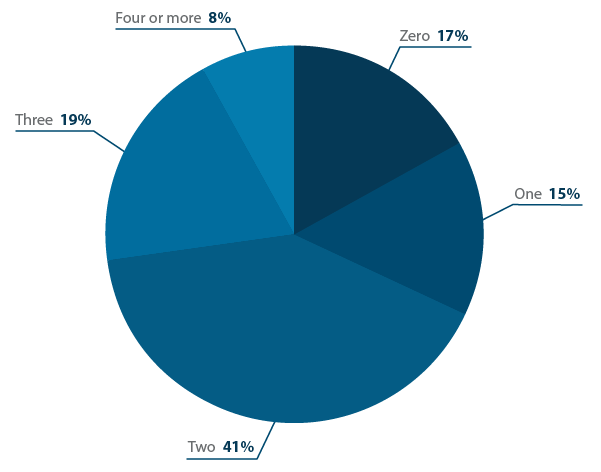 In 2015, Capterra surveyed 400 healthcare professionals to find out how they chose and used electronic health records software. Capterra pioneered the business software connection industry 15 years ago. Our goal is to bring together the right software with the right healthcare team. To do this, we seek to understand medical software buyers' and vendors' needs. Which is why we surveyed buyers to get an integrated picture of just how people are finding, buying, and using Electronic Health Records (EHR) software. We asked about who uses the software, what kind of software they use, what features they use and don't use, want and don't want, and how software has impacted their practice. We hope the results in this EHR software report provide valuable insights regardless of what side of the healthcare industry you fall on—buyer, user, or vendor. If you find any part of it helpful, please share it with your colleagues. And if you think of any follow-up questions, please let us know so we can include them in our next survey. EHR software had the biggest positive impact on patient safety, records security, and time spent finding and updating records, with twice as many reporting their EHR had a significant improvement as slight improvement. Avg EHR buyer spends $117,672 per year, $31,710 more than they expected.Tweet ThisPeople spend, on average, $117,672 per year on EHR software, which is $31,710 more than they expected to spend. 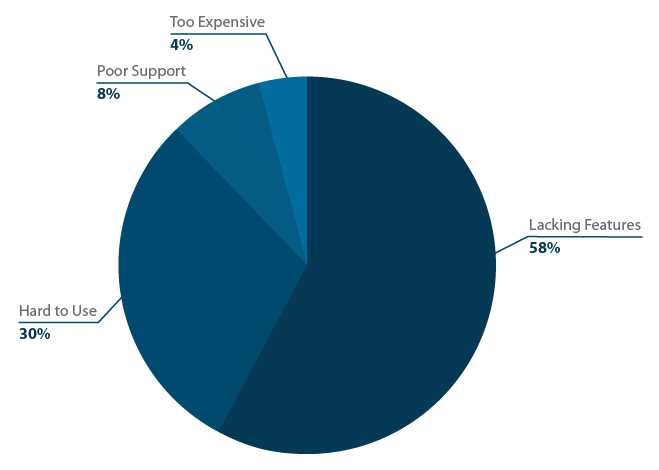 Only 7% of respondents are dissatisfied with their EHR, and of these 89% are dissatisfied due to lack of features and usability vs. only 12% over poor support or price. The market for electronic medical records and health records (EMR) Market for EHR grew to $24.9 billion in 2014.Tweet Thisgrew to $24.9 billion in 2014 and the market is predicted to rise to $35.2 billion by 2019. One health information-technology contract alone, for the Pentagon, could ultimately be worth more than $10.5 billion, spread over its 18-year life. 80% of hospitals used EHR in 2014.Tweet ThisThe vast majority, 78%, of office physicians were using basic electronic medical records as of 2013. More than 80% of US hospitals used some type of EHR in 2014. We asked users about the EHR software buying process. Their answers provide insight for others looking to plan an EHR purchase, and for vendors looking to help buyers make the software search as painless as possible. 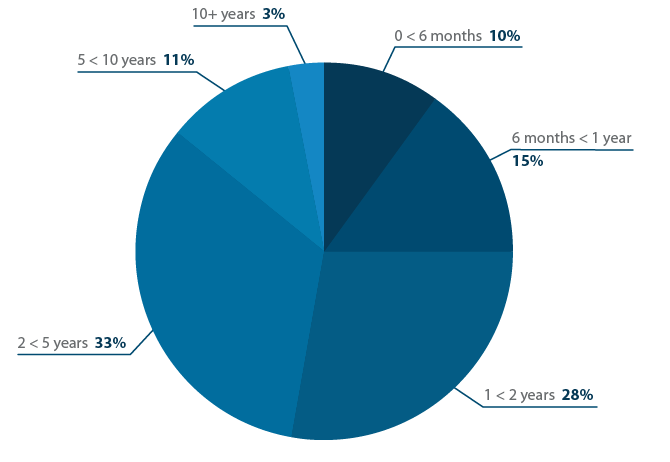 How long have you been using your current EHR software? Were you using a different EHR system before purchasing your current software? Why did you switch software? 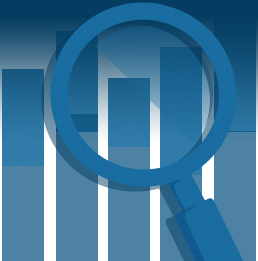 How long in months did you spend searching for your EHR software (from research to final purchase)? Respondents did not expect to spend much time shopping for EHR software. The majority, 57% thought they would spend under six months to find the perfect system. For the most part, people's estimates for how much time they'd need to spend looking for EHR software were accurate. 56% of respondents ended up spending six months or less searching for an EMR. 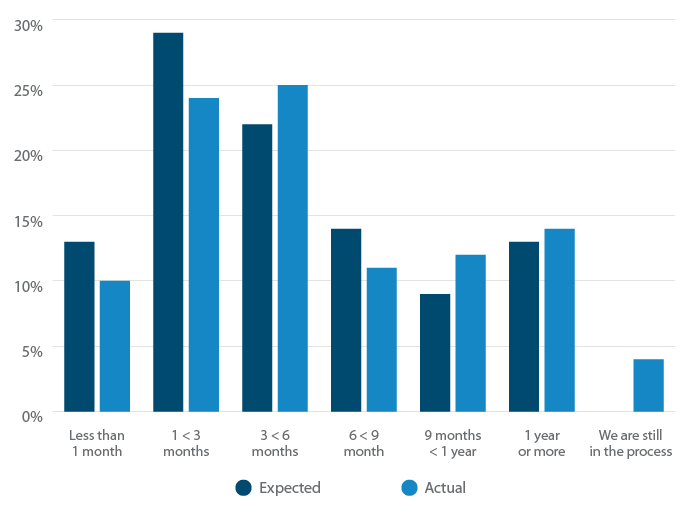 How long (from installation to full adoption) did it take to implement your EHR software? 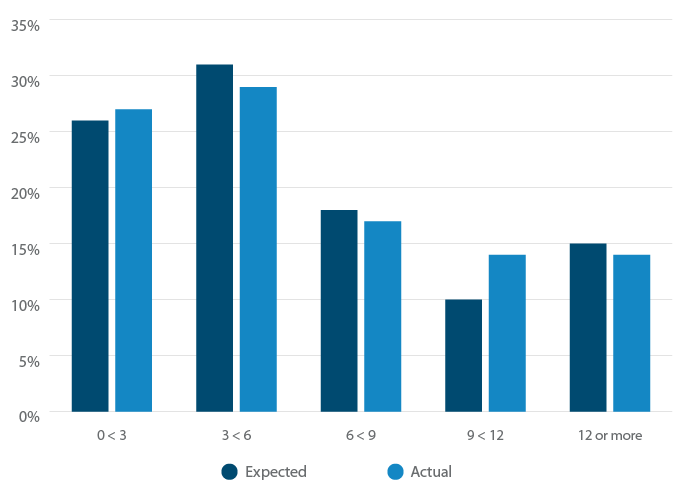 People's estimates for how much time they'd need to spend implementing EHR software tended to be optimistic at the top and pessimistic at the bottom, with 64% assuming they'd be up and running in fewer than six months. The people who guessed in the middle were most accurate (59% actually were up and running in under six months). How much did you expect to spend (annually) for your EHR software and how much did you actually spend? What factors most impacted your purchasing decision? People considered functionality to be the highest priority when choosing EHR software. Ease of use was a close second. People considered functionality to be the highest priority when choosing EHR software.Tweet ThisGiven how important a tool you work with everyday to make life and death decisions is, it's understandable these are the primary considerations of respondents. Price was a distant third in importance, likely because of how expensive EMRs are known to be. After that, support, implementation training, company reputation, and software popularity were ordered most to least important to buyers. 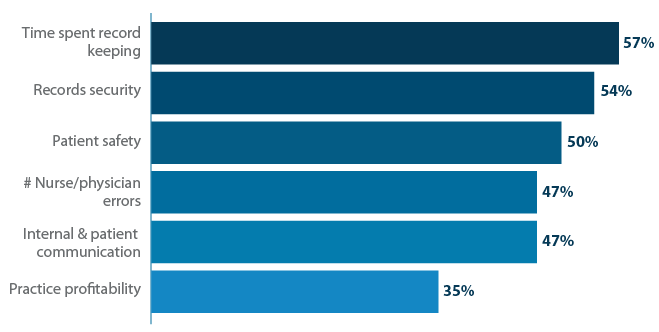 A high percentage of respondents who use EHR software do not describe their role as physician, nurse, or even administrator (over a third, 36%, chose “Other” to describe their role). Which best describes the type of practice you work in? As EHRs are used mostly by non-physicians and are most useful at scale, it makes sense that hospitals are overrepresented among EHR users at 45% of the total. 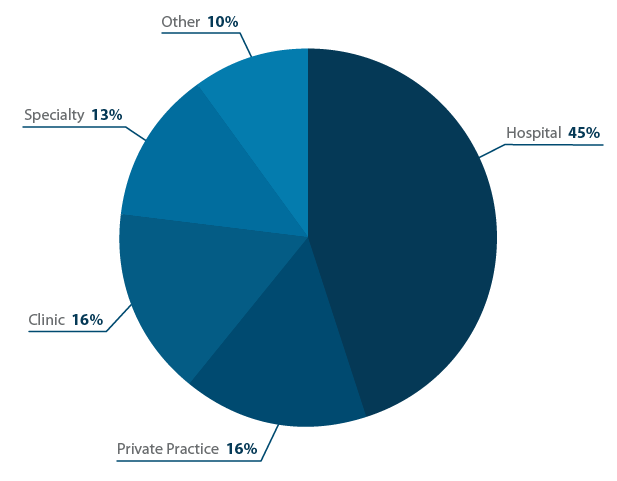 45% of EHR users work in hospitalsTweet ThisClinics and private practices make up another 32%, while specialty offices are the least, at 13%. Statista predicts that by 2015, total revenues of general private medical and surgical hospitals in the United States will reach approximately $813 billion U.S. dollars. 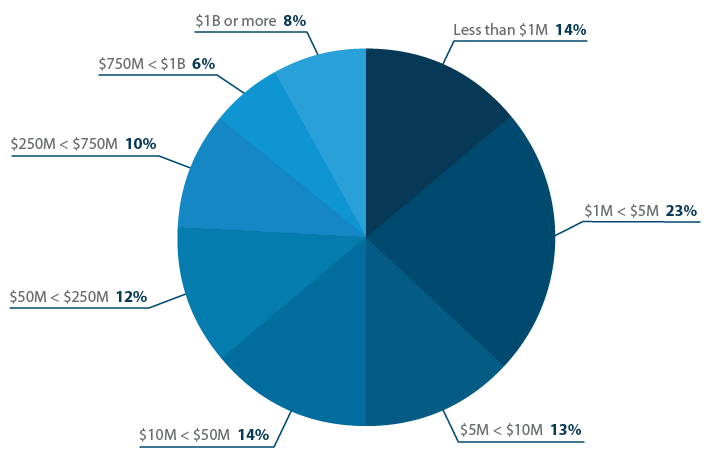 The most common revenue band for organizations using EHR software is $1-5 million. 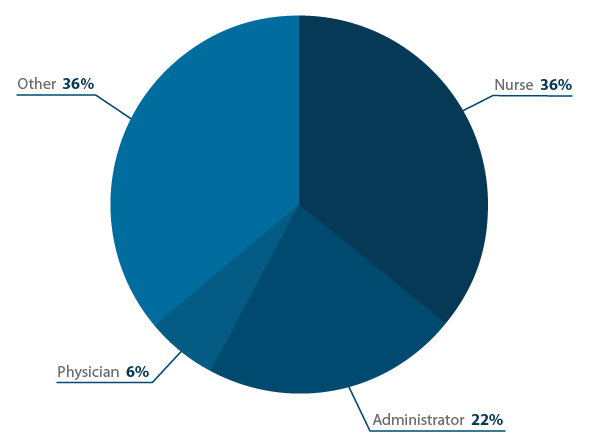 How many healthcare providers use your EHR software? Answers clustered at the top and bottom, with most respondents working in a setting with more than 1,000 healthcare provider EHR users, but then the second most common answer was 2-9 users. Considering the expense of buying and setting up EHR software, the high number of clinics with a small user base is somewhat surprising and could be indicative of Meaningful Use incentives pushing smaller providers into getting EHR. How many total users access your EHR software? Again, most respondents work in a healthcare setting with more than 1,000 total EHR users, but here the second most common answer was 10-49 users. This indicates that there are a lot of people who aren't physicians using EHR software (likely admin and office support staff). All of the most popular EHR software vendors in the survey are included in our previous research on the top 20 most popular EHR software. But, interestingly, the order differs. Which EHR software are you currently using? Is your EHR web-based/hosted, or is it on-premise/installed locally? 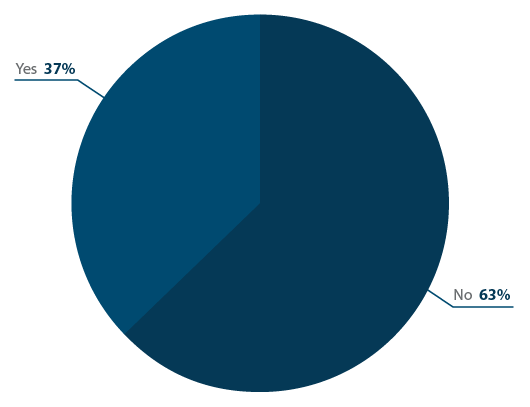 By a small margin, most of our respondents use installed EHR software (56% to 44%). It appears that users are slightly behind the industry-wide trend toward web-based software. Looking at our EHR software directory, 155 are web-based, 79 are installed, and many allow some combination of the two. 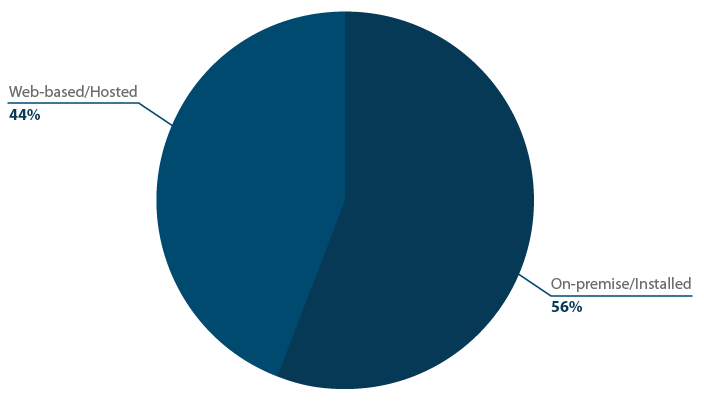 Installation type by length of software use. 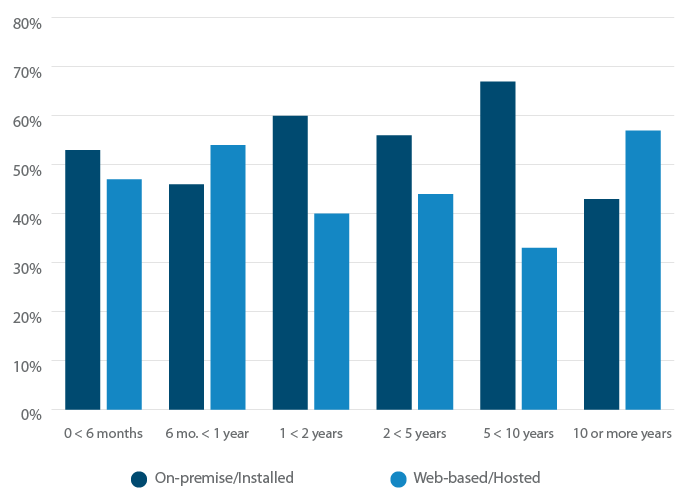 Are people who have been using the same software longer more likely to be using installed software? There is a slight positive correlation between length of use and deployment method (so, kind of). The top five most requested features are voice recognition, mobile integration/app, 3M/other medical dictionary, telemedicine capabilities, and marketing functionality. EHR features respondents wish they had. EHR feature requests by role. Physicians listed telemedicine capabilities and voice recognition as equally most important. They were least interested in the ability to submit billing/claims electronically, E/M coding advice, e-prescribing, and appointment booking. Have it but don't use it. More than twice as many people have the ability to submit billing and claims electronically and mobile integration/app as actually do so. Want it but don't know if they have it. 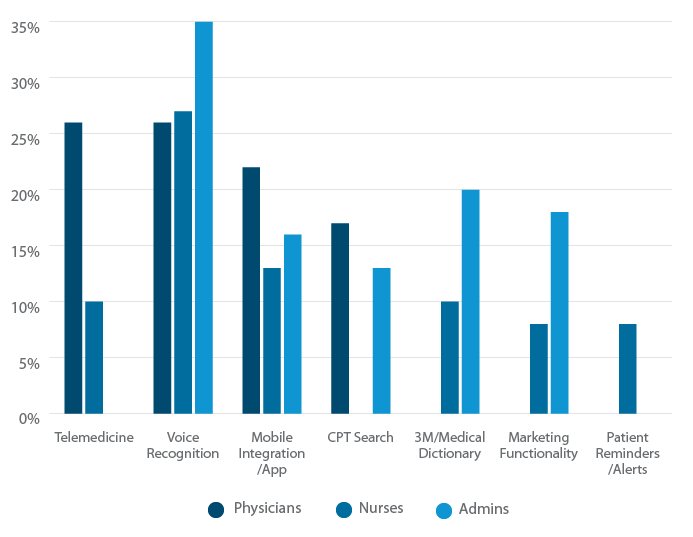 Although voice recognition was one of the most sought features among nurses and admins, the majority of respondents are not sure whether their EHR software has this feature. Same for nurses wanting mobile apps or integrations, but not knowing whether it's available to them. And although admins very much want a 3M or other medical dictionary, nearly as many didn't even know if they had the feature as reported having it. This lack of awareness around desireable software points to a general lack of effective software training. A shocking number of respondents did not know whether their EHR software was ONC certified, more than knew their software had the feature. The majority of users didn't know whether their software offered ROI metrics, which may point to the fact that the majority of users are not responsible for ROI calculations. E/M coding advice was similar, though slightly more people knew their software had the feature. For telemedicine capability, slightly more users were unsure whether their software had the feature then knew they had it. Slightly more than half of respondents who had access to telemedicine capability use it. Almost no one who doesn't have it wants it. Only about half of respondents who had access to E/M coding advice reported using it. Same for Meaningful Use certification, marketing functionality, and e-prescribing. These numbers indicate not so much that the features don't get used, but rather that the individual respondents don't use these software features themselves. Physician scheduling is a highly used feature, as is CPT search and patient reminders and alerts. A patient portal is also highly used, and almost no one who doesn't have CPT search or a patient portal wants one. Nearly everyone has and uses appointment booking and specialty-specific chart templates. People are quite happy with their EHR software, and sky-high satisfaction rates belie reports of an industry that provides subpar products. 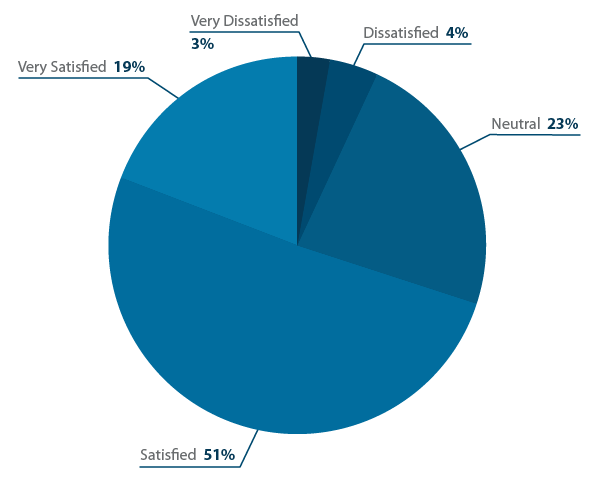 How satisfied are you with your current EHR software? Why are you unsatisfied with your current software? Of the few that are dissatisfied or very dissatisfied, the most commonly cited reason was that their software lacked certain features. The features respondents most often said they do not have and want were voice recognition, 3M or other medical dictionary, and mobile app/integration. The second most often cited reason was that the software is hard to use. Together these answers comprise 89% of dissatisfied responses. 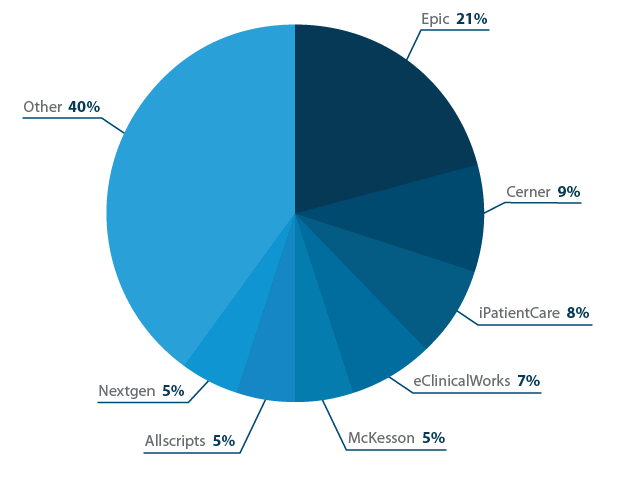 How much impact has your EHR software had on the following? For every area, most respondents reported that their EHR software had made a significant improvement. EHR software had the biggest positive impact on patient safety, records security, and time spent finding and updating records. 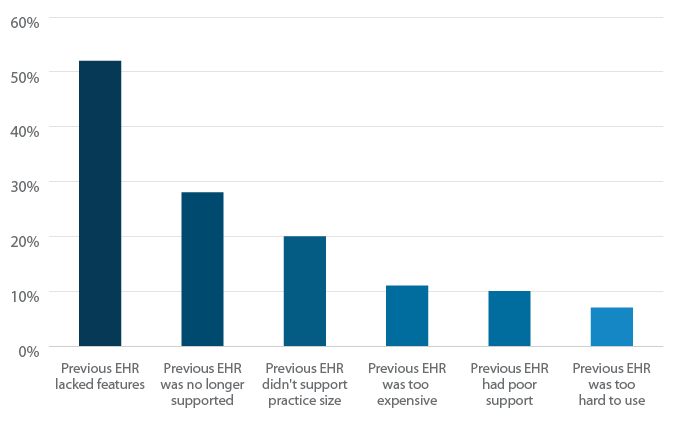 Twice as many respondents reported their EHR had a significant improvement vs. just a slight improvement in these areas. Results between slight and significant improvement were closer for number of data errors made by nurses and physicians, patient communication and collaboration, and practice profitability. But, again, this may say more about the respondents than the software, since many of them may not be familiar with how many data errors nurses and physicians make, how well the practice communicates and collaborates with patients, or practice profitability. It may be for this reason that more respondents answered “not sure” about these areas than patient safety, records security, and time spent finding and updating records. EHR software is not without its detractors. Pittsburgh Cardiologist Dean Kross studies healthcare IT. He claims EHR software has been unable to improve overall outcomes or reduce costs in the private sector despite a track record spanning more than a decade with complete freedom from oversight. Another huge problem is that most EHR software is not web-based and doesn't play well with other software systems, making it difficult to achieve a chief goal of EHR software, which is making health records easy to share across healthcare settings. Yet, for all the reported problems, we found users are mostly very happy with their software, and see it as having positively contributed to some really important key performance indicators, including patient safety, records security, and time spent finding and updating records. There are, of course, areas with tremendous potential for improvement. User training will help close the information gap between the features users want and whether or not their software offers these features. 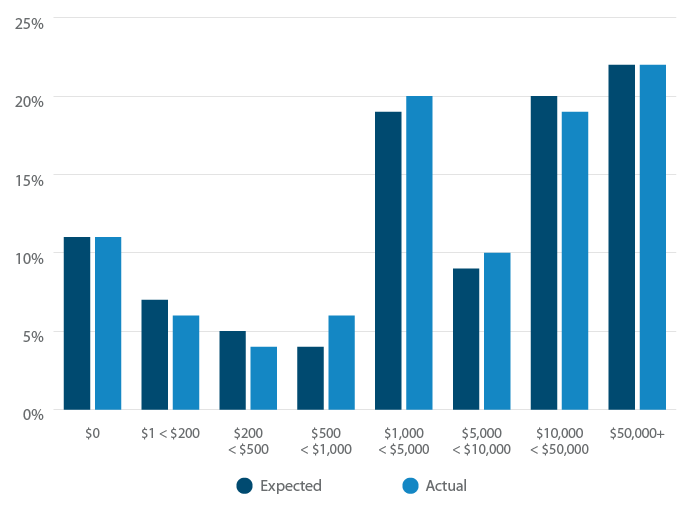 Pricing transparency will help clinics and hospitals better budget for software, closing the $31,710 gap between what buyers expect to spend and what they end up spending. These and other changes will be exciting to track over the coming years. Capterra collected the data in this EHR software report through a 22-question survey of current Electronic Medical Record/Electronic Health Record software users. It was conducted online over the course of a one week period and received responses from 400 healthcare professionals in the United States. Thanks so much for reading the EHR software survey report! This has been a project of the Capterra Medical Blog, a place for people to learn how to use technology to improve outcomes, increase efficiency, and overall advance the field of medicine. The easiest way to never miss a post is to head to the blog and scroll down to subscribe via email to our monthly newsletter. And again, if this report has been helpful, please share it with your colleagues via email or on LinkedIn, Reddit, or Twitter. Cathy Reisenwitz writes about medical software and technology at Capterra. Her writing has appeared in The Week, Forbes, the Chicago Tribune, The Daily Beast, VICE Motherboard, Reason magazine, Talking Points Memo, and other publications. She has been quoted by the New York Times Magazine and has been a columnist at Bitcoin Magazine. Her media appearances include Fox News and Al Jazeera America. If you're a medical software company looking for more exposure, email Cathy at cathy@capterra.com. To read more of her thoughts, follow her on Twitter.